The Ostentatienne had an overwhelming presence that would make it the ultimate "look-at-me-mobile" today. MOTORING NEWS - It had all the bling one could shake a stick at, a genuine truck chassis by International with giant 20 wheels and general over-the-top styling. As they say, the whole is more than the sum of its parts: so the Ostentatienne had an overwhelming presence that would make it the ultimate "look-at-me-mobile" today. 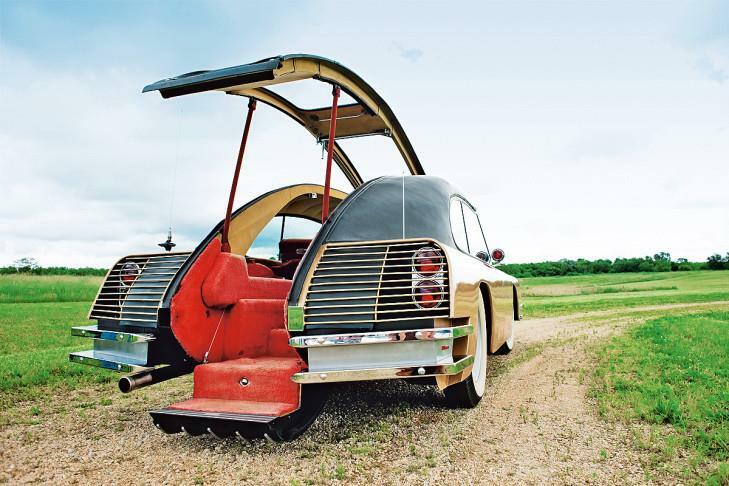 Between 1967 and 1979 Bruce Mohs, the founder of Mohs, built limited-production automobiles on custom chassis, to specification by the International Harvester Company. Mohs owned a seaplane service company in Madison, Wisconsin. The Ostentatienne measured a massive 90 wide, 69 tall, 246 long, and weighed some 6 100 lbs. The Opera Sedan must have been a leisurely affair, as it was powered by a 250hp 304 CID V8. The actual seating space for such a monstrous car is not all that generous. Given the lack of real pillars, the roof appears to be cantilevered. Mohs was a bit obsessed with safety, which explains some of the protuberances. But the cantilevered roof probably didn't give much roll-over protection. But there's genuine walnut on the dash. There's also 110V power, a fridge and other amenities not customary in mere automobiles. Only one prototype was ever built, at the original asking price of R274 400 (at the current exchange rate). From our perspective, it makes the Ostentatienne look almost reasonable, considering the exclusivity. And with a rear entrance at that, one could make a graceful and newsworthy entrance at the Oscars ceremony. The prototype, still owned by Bruce Mohs, was in storage for decades. In 2009, two Wisconsin high schools undertook its restoration. A personal friend of Mohs, Fred Beyer, coordinated the restoration and displayed it at the 2009 Iola Car Show in Iola, WI. 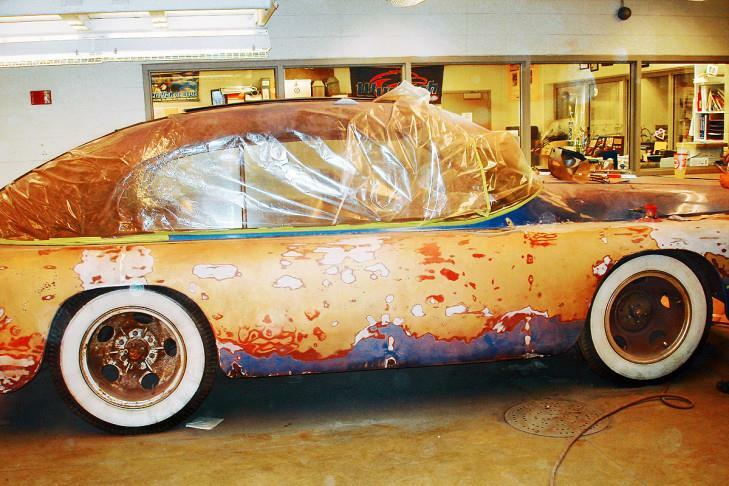 Students along with their instructors Jay and Bob Abitz spent 16 weeks and over 400 hours repairing rust, fabricating panels, and restoring the paint and body. Retired teacher Fred Beyer, together with Mike Carnahan and the students, performed all of the disassembly, mechanical repairs, detailing and re-assembly. The restored sedan was on display for almost a year at the Wisconsin Automotive Museum in Hartford, WI. The Opera Sedan is now featured along with the SafariKar at Wayne Lensing's Historic Auto Attractions museum in Roscoe, Illinois. Mohs was also in the news in 1973 with the Safarikar. It was somewhat familiar at the front, but the rest was a design unto itself. 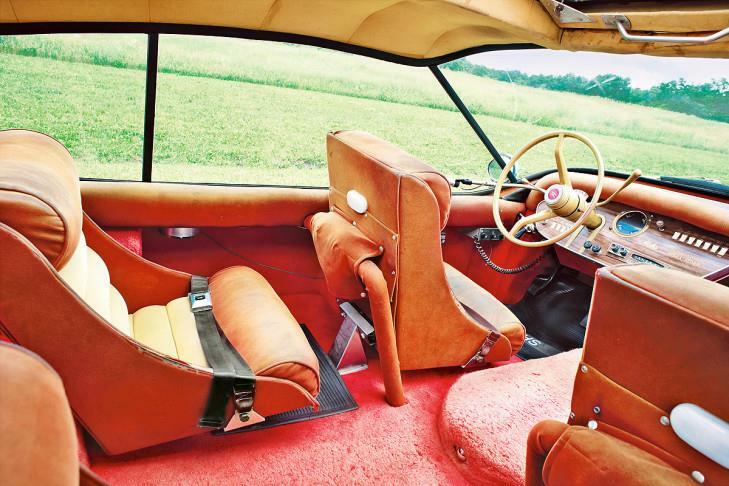 The Safarikar was less ambitious, based on an International Travelall. 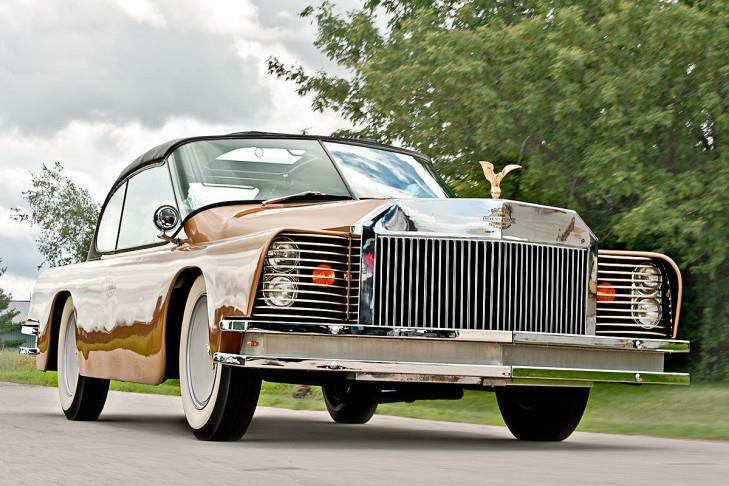 It was a dual cowl phaeton, with skin of Naugahyde stretched over foam padding. The doors opened outwards on sliding rods, presumably for side-impact protection. But how could the Ostentatienne, ever be topped? There was just no way - then or now!